Moving houses or office or business can be one of the most stressful times in life. Everyone who wants to move from one corner to the other corner expects a moving company which cost affordable price and provides stress free moving. The First step Moving is best suggested company in the Frisco City. They make the moving process as smooth as possible. They are good in loading and unloading of customer’s items. They work so hard and make sure that every item they carry into the truck is treated with respect and honour. They can also rent trucks and containers for moving long distances. They take help of U-Haul trailers, vans and for packing of grocery items, they carry moving boxes. Packing of fragile items in boxes is an easy task for them. They are quick, efficient, friendly, and fully prepared to handle any type of furniture. They disassemble the furniture for easy and damage free shifting and can reassemble the items in the desire location. They can also move the items in house from one room to another or of same building. They provide dollies, furniture tools, plastic wraps, blankets and ropes from avoiding damages to the items while moving. Get an estimate for quote to have a smooth move. First step Moving Company was established in 2015.They have entered into this business to make a difference to the customers and employees. Everyone is treated with respect and like family. They are former military owned and offer military discounts. Christy V. is the Managerof First step Moving Company their goal is to open a premium moving company for those that want to move at a higher quality level. 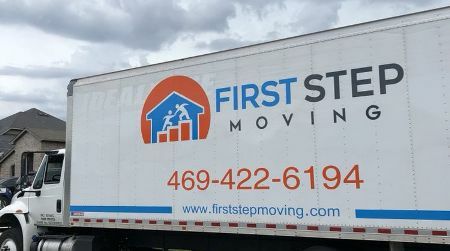 After several moves and experiences the owner of First Step recruited likeminded, veteran moving leadership to create an environment that is friendly to both the movers and the customers. 11625 Custer Rd, Ste 110-173, Frisco.